Riding an ostrich sounds like a lot of fun, but taking care of a live one costs tons of money and is illegal in many circumstances. The next best option is to create the illusion that you're riding an ostrich. The best way to achieve this is with an inflatable suit that looks like a big bird. This one even comes with a fan, so no lung power required. Drumming up business for the Ghostbusters is rather difficult with Gozer being sent back to its dimension. 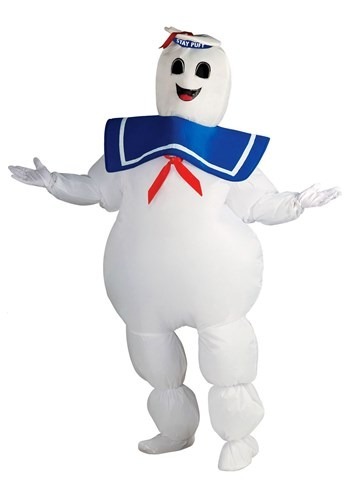 So, you could sit around and just hope that some ghosts come around and cause trouble, or you could run around town making a ruckus as the Stay Puft Marshmallow Man. Just watch out when Egan, Venkman and Stantz actually show up; those proton packs smart. Your dream of being a giant blueberry can now, after years of hoping, come to fruition. We're not going to judge. 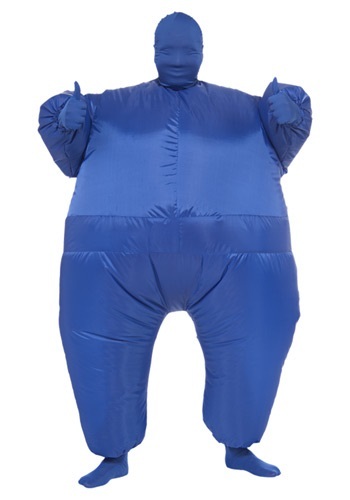 We're just here to give you the opportunity to get the inflatable blue costume that's going to make it all a reality. Dress like a caveman, act like a caveman. We welcome you to the prehistoric era with a Caveman Inflatable Club. Common uses: killing prey and accessorizing your Flintstones Costume. It’s win, win! Everyone remembers the waddling roly-poly clowns from childhood circus outings. This Child Inflatable Clown Costume will give your child the same memories. It includes instructions for installing the battery pack to inflate the suit. Add funny clown shoes, makeup and a wig to complete the look. If the furthest parts of the world there are races that you have to know a secret password to watch. These races involve the greatest and most famous of noble men on top of ostriches racing against each other. But why is this so secret? 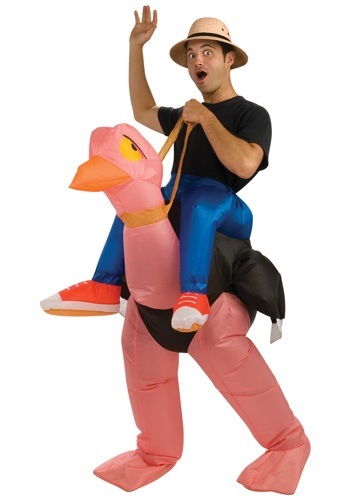 Have you ever fell off of ostrich? It is quite embarrassing. 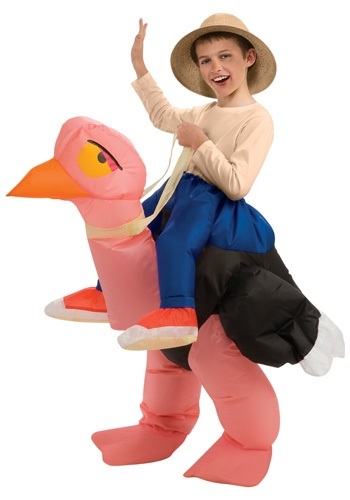 So now you can give your little one to become the greatest ostrich racer ever in this inflatable costume. 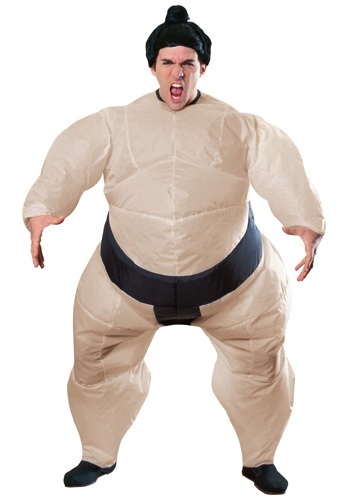 Now your little one can get ready for a battle, a sumo battle! When he wears this funny suit he'll feel like he could force anyone outside of the ring. 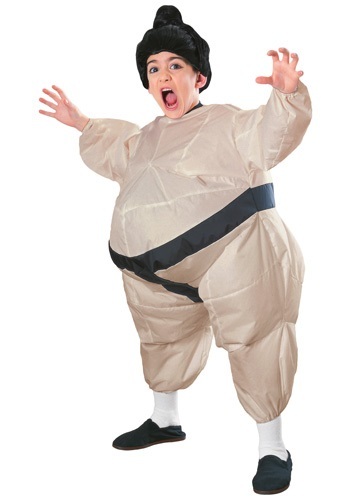 This is a great costume for your child to get a few laughs at his next party! Hey kid, you pack one hella wallop! Don't miss your chance to go toe to toe with the pros. The Giant Inflatable Boxing Gloves will place you a fist above the competition. The 80's were a time for for neon clothes, crazy hairstyles and, of course, sweatin' it out to some oldies. You could slap a pair of sweat pants on and do some cardio, but where's the fun in that when you have the option of doing it with a little bit of comedic relief? 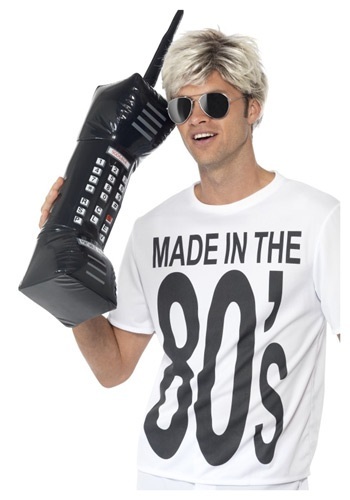 So queue up those oldies on your stereo and inflate this baby up. It's going to be a good time. 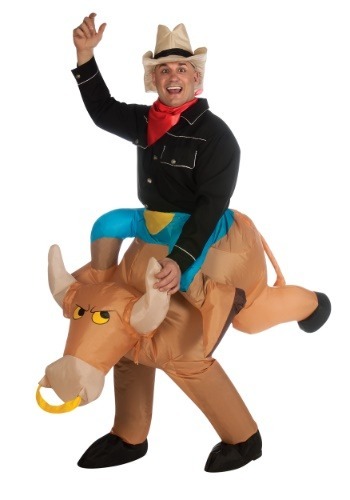 If you've ever wanted to try bull riding but didn't want to risk broken bones, this Inflatable Bull Rider Costume is for you! 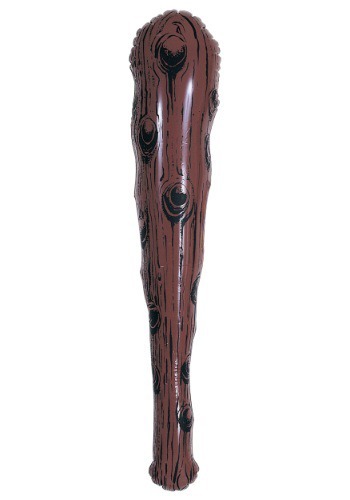 It inflates with a battery-operated fan; your legs form the bull's front legs, and the inflated costume has a cowboy's legs and the bull's head and hindquarters. Yeeee-haw! "It's right here, Ray. It's... looking at me. 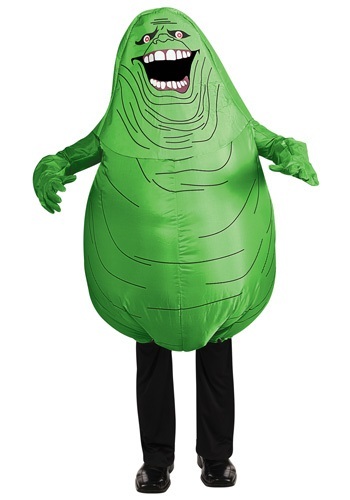 "Become the ghost of the Sedgwick Hotel when you slip on this Slimer costume. You'll be all set to scare and slime the Ghostbusters as they try to trap you. This is perfect for fans of the classic film who aren't afraid of no ghost! The Ghostbusters have dealt with many spirits over the years but they will never forget the first ghost that they ever caught, Slimer. This green ghoul was roaming the halls of the Sedgewick hotel looking for anything he could eat off of the room service carts. After years and years of complaints the manager had finally had it with this unwelcomed guest that he called the Ghostbusters to get rid of him. What the manager didn't know is that no ghost had ever been caught with the latest in ghostbusting technology. Slimer got to be the first spirit Peter, Ray, and Egon ever caught and your little one can become that ghost in this inflatable costume. It's time to enter the ring and take on your opponent! Sumo wrestling is a sport where the one wrestler tries to force the other outside of the ring. If you think you're up to the challenge then be sure make your way to Japan because that is the only country where the sport is played professionally. Once there you can take on their greatest wrestlers to become the greatest champion of the world. But if you're not quite ready to sumo wrestle with real people pick up this jumpsuit and pretend to own the ring.